Barbara W. Hunter: The First Woman to Run a PR Firm in the U.S.
Barbara W. Hunter was the first woman to own and run a public relations agency in the United States. In 1956, Hunter became an account executive at Dudley-Anderson-Yutzy Public Relations. In 1970, Hunter and her sister, Jean Schoonover, bought D-A-Y and Hunter was promoted to executive vice president after all three of the owners died. 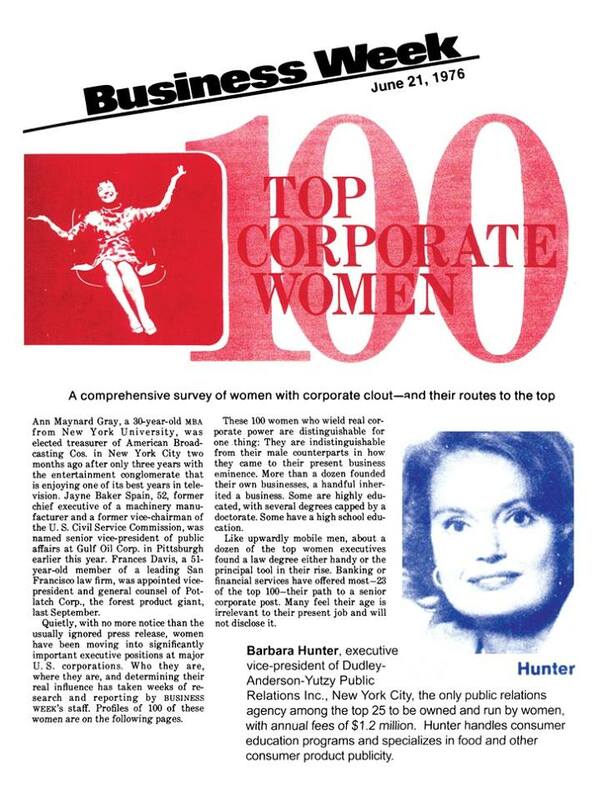 In 1976, Hunter was named one of Business Week’s Top 100 Corporate Women. After selling D-A-Y to Ogilvy and Mather, she founded Hunter Public Relations, which started out as a boutique agency in her bedroom with only three employees in 1989. Within 20 years, the agency grew to work with well-known clients such as Kraft, JELL-O and Campbell’s. In 1993, Barbara received PRSA’s highest honor, The Gold Anvil, for individual lifetime achievement in PR. Today, at 88 years old, Hunter still visits the agency to from time to time to check in.